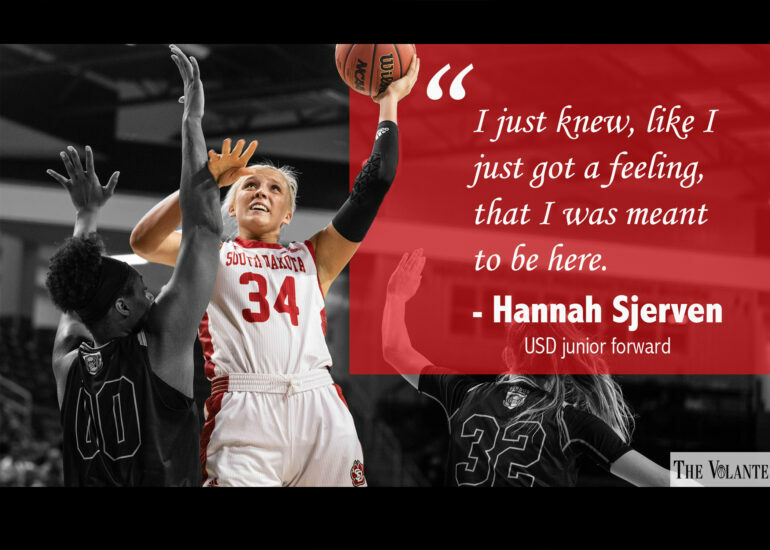 In March of 2017, Hannah Sjerven first stepped foot in the Sanford Coyote Sports Center to watch USD play North Dakota in the first round of the Women’s National Invitational Tournament (WNIT). At the time, no one knew she would be a vital piece to the 2018-19 Coyote women’s basketball team. Sjerven’s journey to USD began like most athletes’, playing their sport at a young age. Her first sport was basketball and, over time, she developed into a national recruit. Sjerven began AAU (Amateur Athletic Union) basketball at twelve years old. There, she met one of her better friends, fellow USD standout Madison McKeever. Sjerven found herself growing into a standout athlete in high school, lettering in three sports. Despite her successes outside of basketball, her family and longevity in the game aided her decision to play basketball at the collegiate level, she said. As a high school recruit, Sjerven had several options. Ranked 23rd in the nation at her position, schools from all over the country reached out to Sjerven. She talked to east coast schools, Summit League schools, but ultimately, she decided on the University of New Mexico. Sjerven’s struggles in New Mexico began before she arrived on campus. Her senior year of high school, the staff member that recruited her at New Mexico—and one of the major reasons in deciding to go there—was fired. Still, she went. When Sjerven started working with the team, the new staff’s offensive scheme and mentality didn’t sit well, she said. She only played 13 games her freshman year, and then decided to transfer to USD. After head coach Dawn Plitzuweit wrapped up her first season as the head coach at USD, she knew she needed a versatile post player to replace graduating Abigail Fogg. “We were really looking to bring someone in to fill her shoes and then we got a phone call from the coach at New Mexico,” Plitzuweit said. The coaches at New Mexico reached out to Plitzuweit about having Sjerven come to USD, figuring she would fit the USD system well. Even with 13 games of college basketball under Sjerven’s belt, Plitzuweit wasn’t concerned. Plitzuweit said she believes working with players one-on-one benefits both players and the team as a whole, a philosophy that attracted Sjerven. According to NCAA policy, all student-athletes who transfer schools are ineligible to play the following season. There are a few rare exceptions, but they did not apply to Sjerven. At New Mexico, Sjerven scored 37 points and snatched 24 rebounds in 13 games. In her first 20 games at USD, Sjerven is averaging 10.4 points and 5.5 rebounds in 18 minutes per game. She isn’t taking all of the credit for her success, and praises her teammates and the depth of Plitzuweit’s roster. On Nov. 28, Sjerven recorded her first double-double (10 points, 10 rebounds) when USD women’s squad beat No. 23 Iowa State, USD’s first-ever win against an AP top-25 team. They did it again in early December, traveling to Missouri and beating the Tigers, ranked No. 22 at the time. In fact, USD is the first Summit League team to beat two AP top-25 teams in the same season. Additionally, USD came out victorious in a double-overtime game against South Dakota State. Sjerven collected a double-double (23 points, 10 rebounds) in front of a sellout crowd, the first in SCSC history. Sjerven admits that her breakout season has been an enjoyable ride, but she believes the team success is the start to the USD women’s basketball foundation.